Have you ever been in the middle of making a project or embroidering a design and thought to yourself, "I'm not really happy with this." It has happened to me a few times, especially with my own designs. I'll get about 30-50% of the way through my stitching and put it aside for a day or two, hoping to return with fresh enthusiasm to finish it later. Sometimes that works and all I need do is replace a thread colour and add another element or decorative stitch, but on other occasions no amount of time away from the design will endear me to it so I cut it into pieces and throw it in the bin. Pretty soon my creative juices free themselves and I get on with sketching and stitching something I'm much happier with. A similar scenario played out at Elefantz HQ the other day. At the moment my fingers are busy embroidering the seven days of the week for May's issue of The Stitchery Club. I showed you the first three blocks last week, but over the weekend my mind would not rest about an increasing dissatisfaction I had with the Tuesday design. Ignoring my feelings I moved on to stitch the Thursday block which I really loved - the strawberries and pot of jam were inspired by afternoons spent making delicious berry jams for my family which they would spread on thick buttered slices of freshly baked bread. Deeply satisfied with Thursday, I threaded my needle to begin the Friday block. BUT, I simply couldn't get past those feelings of disappointment with Tuesday, so you know what I did? I went back to my sketch pad and re-drew the design. It wasn't that the whole design bothered me as I still like it, especially the overall idea, but it just wasn't fitting in with the other six 'days of the week' designs. I needed to assess what I didn't like about it in order to tweak the idea and restitch it, eventually coming to the conclusion that I needed to remove the sharp angular windowsill and soften the bird. What I loved about the block was the wooden bucket, the flowers and the scroll at the base of the windowsill, so I kept them and changed the rest of the design for this softer, rounder display. See how one Tuesday is sharp and the other is soft and gentle? I'm really happy with the new Tuesday! It's a 'me' design and one I'm delighted to put my name on. It took time away from my already tight stitching schedule, but in the end it was important that I follow through with the best of what I have to offer. But tell me, which one do YOU prefer, and why? 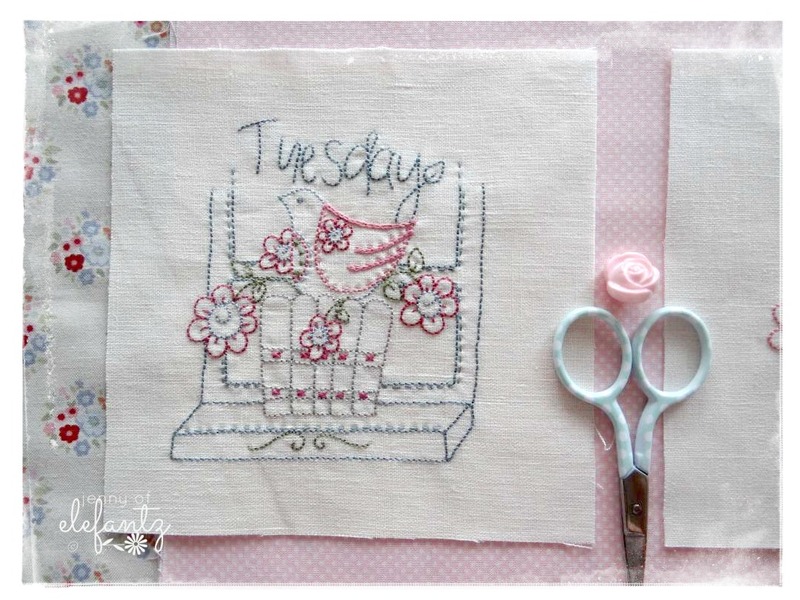 Because I've already shown the original Tuesday as well as the new one, both versions will be inside May's issue of The Stitchery Club for members to follow their own preference. They can stitch the one they like best, the one that suits their style - after all, none of us are exactly the same. It's simple. All the information is here. You'll receive six (sometimes seven) new stitchery patterns delivered to you via email every month plus a free gift for joining! I decided not to cut up the first Tuesday stitchery because I thought perhaps one of you might like to have it? I'll post worldwide so just leave a comment below, one comment only, and I'll draw a winner on May 6th Australian time. If you're anonymous or a 'no reply blogger' then I will not be able to contact you should your name be drawn, which will make you ineligible. To be eligible please leave your name and email in the comment. I might even include a piece of Tilda fabric...yes, I think I will. Would love to receive any stitchery from you, just to see up close how perfect the stitching looks. Oh my, I really didn't think there was anything wrong with your first version but you yourself have to be happy with it. They are all lovely Jenny. I like the first one, but you're right about it not fitting in with the others. It was too angular and busy in comparison. Thanks for sharing the tea towel link. I'm going to use the tutorial. They are sweet. Oh I can't wait for this collection to make its way into my in-box....I happen to love both Jenny, I couldn't see anything wrong with the original but when you show them with the group of days, I can see how the softer version works in nicely! Oh Jenny if I had one of "your" stitched projects I would be greatly honored to have such a special piece in my very humble home! I would put it in a frame and find a special place for it, and hang it proudly! Thank you for all you do and share! I truly enjoy it all! If I am not picked I want to say Congrats to the winner of your lovely work! Ohhhhh i want to win this giveaway!!!! I started to embroider after fall in love with your amazing work! I'm a huge fan!!! Oh i definitely like the second block better. It's a much simpler and cleaner design. With that said, I'd love to win the other block from you. I can see it made up as a little wall hanging. And of course I'm Terry, terrygiet@gmail.com Thanks for the chance! I love all your stitching. I love the window look and the softer look as well. Love, love, love!!!! It would be awesome to have on of your hand stitched designs. Thanks for doing a give away. How fun!! Jenny, you are always an inspiration and your workmanship is exquisite. How wonderful to offer a piece of your hand and heart. Your stitching is so beautiful I would love to have one. I prefer the windowsill but I understand why you took it out. Either one is great. I would love to win! Yours is one of my very favorite blogs and I share it with friends! I appreciate your focus on home and family. Thank you for the chance! It would be impossible to chose a favorite, because just like your children you love them all and appreciate the differences of each!!! I love all your designs and am in awe of your God given gift! I'd love a chance to win the block, Jenny. I think if I did, I would make it into a little quilted runner and keep it where I could see it. It would remind me that God is shaping me by removing the "hard edges" to leave a "softer and gentler design". What an encouragement!! Thank you for sharing with us! I love your stitchery and patterns! You have inspired me to start embroidering again! Embroidery was the first hand work I learned, taught to me by my grandmother. She lived 1200 miles away, so she would send me (sugar sack) pillowcases, I would embroider them for her and my mom would mail them back! Seeing your beautiful hand work makes me want to do some embroidery! Both the old and new Tuesday designs are very pretty. I prefer the new Tuesday block design as part of the whole as it is simpler and less busy. As a stand alone design I think the old Tuesday design would be perfect. I like the second one the best. The second one seems "softer". I love to embroidery. One of my favorite pass times. I am so glad you kept it! I think it is beautiful, they all are. You have a lot of talent. Oh Jenny it would be such an honor to receive a piece of your work! I admire you so much as a person and your work as a needlewoman is unsurpassed. And Tilda fabric - gorgeous. We can't buy it in the USA and it is always so perfect for making stitchery projects. Congratulations on your new grandbaby too! You are blessed! Hi Jenny! I think the new design goes so nicely with your set--but I like the initial Tuesday too! I've been working on the Postcards from Heaven series. I would love to have a piece of your stitching just to hold, study, and cherish! Your stitches are always so consistent and I'm sure they are as beautiful in person as they are in the lovely photos! I love them both..but the second one seems to radiate a little more. Love all the projects you make..and share with us all! WE are Blessed by You! Your embroidery is beautiful! I hope I am the lucky winner! Your designs are always soft and pretty. So generous to make your stitching a gift. I love both patterns, but the creator should have the final say on what to leave in or take out. Those colors that you picked to embroider them are very pretty and I would love to have a "Jenny original", it will be an heirloom handed down the female line. Thanks Jenny, take care. Guida Parker. I really love both versions, but agree that in the overall with the other blocks I would choose the new too. I always find it interesting how much our heart is involved in our stitching and so lovely to find somehow your heart in your stitcheries too. Really beautiful and inspiring. Would be a special treasure to have a personal stitchery made by you, smile! have a nice day in the other part of the world ! I actually like both versions but I see what you mean about the new one being softer. You could have just rounded the window sill and window frames and this would have also made a difference but you must be happy with your own designs. It is hard to stitch something when we are not enjoying it and something is nagging at us. Best to walk away and come back to it with a fresh approach. All those stitcheries are gorgeous as usual. Your designs always put a smile on my face. They both look amazing, but I do think that the second one fits in with the other stitcheries much better than the first. Good call! Monday is my favourite as it reminds me that even through the rain (of life) there is always a blessing, and that makes me smile. I love your design, and it would be an honor to have something YOU have stitched. Thank you for this chance to win. Please, count me in. I love it!! (I'm doing a giveaway in my blog too! 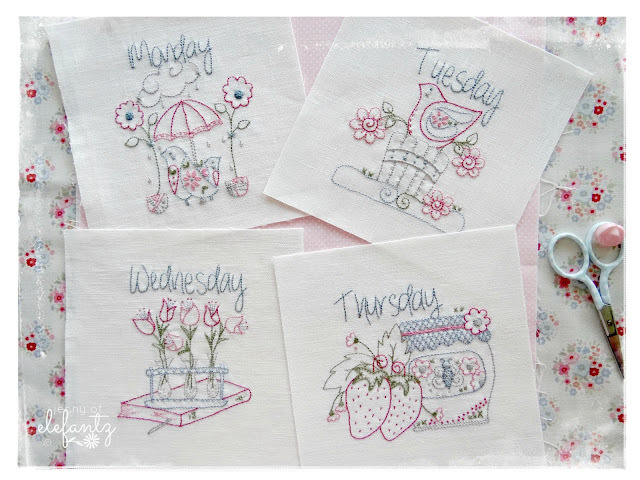 I like both Tuesday designs - in fact I love all of them especially Thursday!!! I love the first. I think I can't be sweet and soft everyday of my life. I can be sharp at times. So, I love a sharp embroidery . For the sharp days :) Thank you Jenny. Have a good day. I really like the original Tuesday design, but I also see your point. It did not fit as well into the collection as the new one does. I love both of them but, the second one looks less busy and is so simple and cute. Your work is just beautiful and would love to have one. You are amazing! I loved the first Tuesday design just fine, until I saw the second design. LOL I think they are both wonderful, but the second one does look much softer. I would love to own a Jenny creation!!! Your first and second stitchings are both wonderful. I think I actually like the first one better. Thank you for the giveaway and for all of the inspiration that you share with your readers! Thanks for the opportunity to win a beautiful original. Lord bless. I do think that the second block is more you but both are beautifully done. I am now working on my "A Year in the Garden" blocks, I have completed January and December and will get two more ready for stitching today. Jenny, as you can see from your many responses we all love your work. Both Tuesdays are lovely. It would be an honor to have a Jenny Original. Thank you for sharing. Both of them are nice but I like the second one better and it fits in better with the rest of the designs. Ho mais quelle chance se serait de recevoir une si jolie broderie de votre part !!!! Both blocks are wonderful Jenny! I rather am that way, one day this one day that and so forth. I also try and pick a design for the person I am stitching for. What a great opportunity to receive one of your stitching projects though! Thank you for this great and pretty piece of yours ...the chance of course! Have a fantastic creative day! I think the first one is a little bit busy, but I love it anyway, I´m looking forward to start stitching them all. Your designs are always gorgeous. I agree with your design explanations..just as with the Gospel message, an embroidery design is best simple and clean. I am blessed by your blog. Hi Jenny! 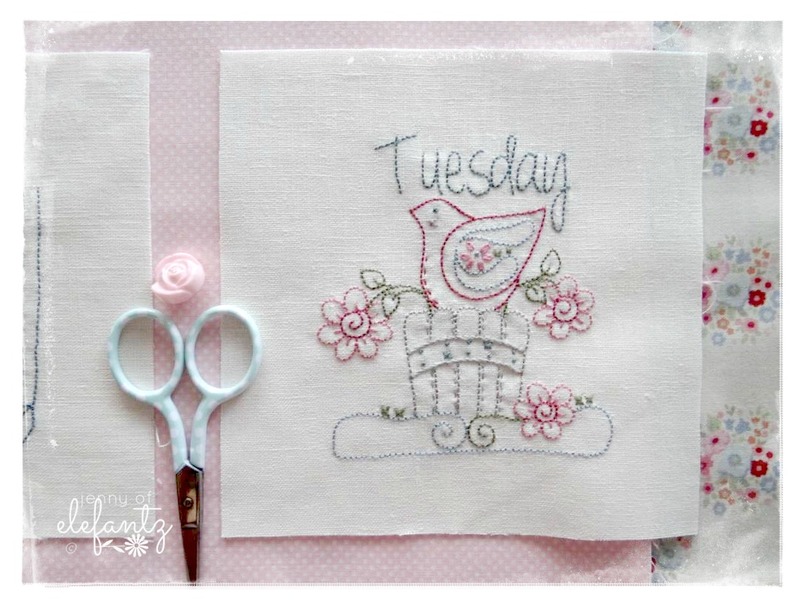 I like both "Tuesday" embroidered blocks. Thank you very much for this giveaway. Love!! Since you have taught me how to do embroidery (didn't know did you!) on your blog, I'd love to have a real "Jenny" block! Also, Tuesday is the day my lovey daughter (who is expecting soon) was born on! I thought your old block was very cute. When shown with the other blocks I could see how it was very structured with the window and the others didn't really have any border. They are both so pretty and your stitching is always amazing and too be admired. I love all of your embroidery designs! They are so lovely and remind me of a simpler time, I would love to win the Tuesday design! Your work really is lovely, and the first block looked perfect but the things I Would have changed with the old block was the lettering of the word Tuesday (which you did) and the soft blue of the bird was over powered by the red and seemed to disappear, and you changed that as well! Now the second block is absolutely perfect-er! Love your work! I liked the original design, but agree that the new "Tuesday" design fits in better with the others. What a wonderful opportunity for someone to win an item hand-stitched by you. It will be a treasure to add to their collection. Wishing you many blessings. I love all your stitchery patterns! Grace, that's what you allowed yourself. And in the end, for our benefit. I love both designs! They will add a personal touch to any kitchen! Always inspiring, Jenny. I am a big fan and would love to win this pize. I would love to win your hand stitched design. All of your designs are lovely. I loved the original version but now that you show them beside the others I can see the first one looks out of place because it's "busier". Sometimes simple is more beautiful like a single rose and sometimes busier is nice, like a garden scene. I think it depends on what the use will be. By itself, as in a hot pad or doily (edged with crochet) for your vanity the first one would be lovely. If you'll be displaying all the days of the week together in a quilt, table runner, etc then the revised design is more suitable. love all your posts and all your designs and yo are a really great stitcher!! I truly like both designs, but I would have to agree that the second version goes best with the other days. The bird seems happier/freer in the new design. 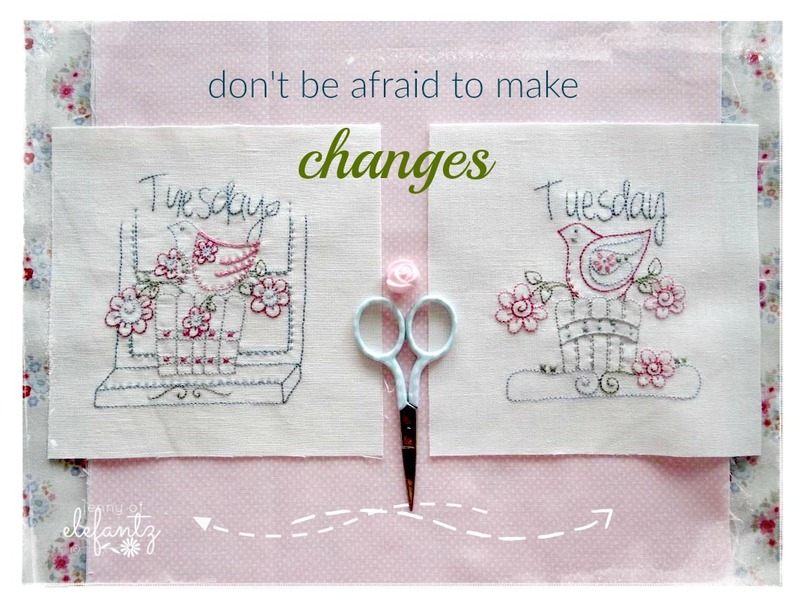 I also like the lettering for "Tuesday" better. And the whole design is more airy. Some good changes, but like I said I like the first one too. Oh how lovely to actually have a chance to own a piece of something you stitched. Thanks. Yes I liked the first design but I agree with you the second one is a bit softer and therefor suits your style the best and goes with the rest of the days the best. Hi Jenny from humid & warm Louisiana! I'd love to have the Tuesday block! Why? Because I'm a Tuesday child and because having something you've stitched would be very special! When I first saw your blocks, I really liked Tuesday as I love the bird on the windowsill; it's a very happy piece. I'd love to sip a cup of tea and look out the window to see a little bird perched there. I see your point in softening the edges and I know the feeling when something isn't right with a stitched piece. I do think 2nd version ties in well with the other days, but I still prefer the 1st version and the fact that you stitched it is the best part of all. Such a fun giveaway! Jenny, i love all your designs but i do like the second one better. I would just love to have something you stitched! While the original is lovely, I prefer the new block because it is cleaner and less crowded. I would love to win it so I could study your perfect stitches and dream about improving mine. You are so talented! I'd love to see your stitches in person. I've been working on keeping mine smaller & more even, and yes, I've taken stitches out after a couple of days of just not being satisfied. You are an inspiration!! I would love your block. That is my comment. Absolutely gorgeous as all your work is. Love them both but can see why you prefer the second stitchery. I am the same if not happy, no need to continue stitching something. Best to start all over again. While I think the first is lovely--and would be thrilled to welcome it into my home!--I think the second is a better fit for the rest of the designs, with its more spacious feel. They are both so beautiful. Thank you for a chance to win. Jenny, every single stitchery work you do is lovely and I couldn't say it otherwise with those two. But I have to agree with you that the second one matches perfectly to the week project. Hope to be the lucky winner! Love Andrea. Ambas versiones son preciosas, pero prefiero la segunda. Me encantan sus puntadas tan perfectas y sus diseños tan limpios y claros. Guess the third times a charm. I've posted twice to different blogs as I usually don't post. I like both window designs. My favorite is the soft curves, but all of your work is superb and it's really hard to choose. Kathyifft@msn.com love the freedom of change. So beautiful and so sweet! Thanks for the opportunity to win such a lovely work. Wow! I like both of them, but the softer one goes a lot better with the rest of the set. I like both but after looking at both you are right. I would stitch both and not worry too much about it. I am glad you changed it though. I like both blocks,but agree the new one is the better fit with the others, being a clearer design. I love both of the designs. And to think you actually cut up things you do not like....This saddens me to hear this. You have put your heart and soul into making things be it hand stitchery projects are regular sewing. Jenny you should keep them and hang onto them . Because at some point you may decide to rework them or even re gift them as is...For some other to enjoy...Do u remember finding lovely old stitchery projects at thrift shops are I think you call them op shops over there. Think of the wonder someone else would have if finding one of your lovely designs for them to enjoy. You put so much love and work into your designs. I do think the newer designer is lighter and pops from the fabric ..The older is more complicated and has a lot going on. But they are both beautiful. I love all your sticheries. I do prefer the new Tuesday; it matches the others better. When I saw the two Tuesday's together I preferred the first one. But when I saw the new Tuesday with the rest of the stitcheries I can see what you were feeling and the new one fits in just perfectly with the others. Hi Jenny. I love your ‘retuned’ second embroidery as it is softer and simpler thus matching your other embroideries beautifully. I look forward to their arrival in my in-box next month. I like the newer version. The focal point, the bucket shows up so much more. I've been practicing tiny stitches like you do. It sure does take patients. Thank you so much for the giveaway. Oh my, Jenny - how I'd love to win your giveaway. I like the second one better. Without the windowsill, the bird stands out. ALL of your stitching is beautiful! Thank you for the give-away chance. Both pieces are lovely, but it is always good to feel content with an accomplishment, so I do understand the change. I am quite prone to that sort of thing. Have a lovely weekend. I love both stitcher its. I agree that the second one goes with the other days of the week. Thanks for the chance to win. Would be lovely for me and interesting for you to have a winner from Hungary, lol. You're right, the second one is much softer! In the set the second one is much more appropriate. But, I would love to have the first one to incorporate into a tea towel of my own! Both are beautiful but I prefer the second one as it is more open and the emphasis is mainly on the bird. Your stitcheries are beautiful. When put with the rest, I can see why you like your new one. It fits while the old one has too many lines and corners. I don't think I could pick a favorite between the two - both are great designs! Don't know that I've seen any design of yours that I didn't like! Thank you!!!! I love them both but the new one catches my eye. I love your colors, stitches, and patterns. Thank you!!! It is good to know that a professional and I feel the same way once in awhile about what we are doing! I honestly love the first one because it reminds me of the sweet birds who make their nest in one of our cactus pots...although our window sill is really a shelf in the garden. I love all your designs. You are an amazing designer and I sew wish I had the time to create them all. Wishing you a very happy weekend. Thanks for the giveaway. Thank you for sharing your creative process. I think it's natural to want to change things. It reminds me of the process I recommend for using a recipe. I always follow a new recipe the first time and then "tweak" it after that to adapt it to my likings. I like your second version because it's less "cluttered" and more refined looking. I admire your ability to create such beautiful work as I am graphically challenged and don't possess the wonderful skill you have for sketching. Thanks for the giveaway. I love your style of embroidery and your designs. They always look so perfect. Would love to win your original Tuesday stitchery, however, I do think your second design does fit the overall series of the weekday stitcheries better. Also love your Sunday devotions - reading them again throughout the week. I think you are a wonderful designer and a good writer. Thank you for the giveaway. While I love them both and agree that the second fits better with the other days, I prefer the window one - love a window! Thanks for sharing your design process. It's always good to know even very experienced designers such as yourself have a few ups and downs. I do like your modified Tuesday block... Of the four designs shown - I like Monday - I love rainy days and umbrellas. I really like the first Tuesday but can see the second one is a better fit. Why do you cut them up though? Why not just thrown them away? Cualquiera de tus dibujos es precioso, no hay duda. Si tengo que elegir uno, puede que el segundo, menos angular. Pero porque concuerda más con los otros y no por ser menos bonito. Un beso. The first one seems more balanced to me, but anything you make is beautiful! Always love your work Jenny and working on your patterns.They are a joy to make both Tuesdays are fine but I do prefer the second one taking away the window frame at the back of the first one has made a softer version. Creative eyes paint unique designs! All of your work is amazing! I'd love to win your block! What a lovely thought that you would give this block to one of us instead of cutting it up! I would adore receiving this block and would surely treasure it, and then use it for my inspiration and motivation to better my skills. I love everything you make, and love you sharing your creations for us to make. Thank you so much, and may God bless you richly in your walk with Him. Please, do not call it the "old Tuesday block". You had only recently stitched it. Maybe call it the "discarded Tuesday block". Like the other followers of your blog, I would be honored to receive this block, and will display it in my sewing room. I would love to win your pattern. Both designs are beautiful. I love your choice of colors and the "softness" and "joy" of your designs. Looking forward to working on the Thursday design. Strawberries are my favorite fruit. Yum. It will be a pleasure to receive your Tuesday design. What an inspiration to me to have it hanging on the wall in my crafting/sewing room. Have a great day. God's blessings. I like elements of both. I like the cleaner look of the second one--less flowers and the word Tuesday, but I also like the window part of the first one. I am not sure which bird I like best. I would love to have your first Tuesday block. Jenny, Thank you for your beautiful stitchery. I like the second Tuesday better because it is airy, the bird is cuter. All of your designs are just beautiful. Please never stop your passion. And Tilda fabric is pretty special too. Wow! would love to have one of your blocks. I like anything you produce! I would be honored to have one of your hand stitched designs! I think both are gorgeous but I agree that the new one plays better with the others. Thank you! They are both beautiful but I was really excited by the first design because I thought it was sitting on a computer keyboard and that would fit perfectly in my life. I'd much rather be stitching than typing (i.e. working). But you are correct, the new one does fit more nicely in the group so kudos to you for going back to the proverbial drawing board. Thank you so much for all you do and all you share and all you are. Receiving one of your artworks, would be truly amazing. Thank you for this opportunity. I have followed your stitching for some time and like your colours, I would love to have one of your blocks. I like how the second Tuesday block fits the series. I like the change you made to the text, as it is more like the other days. Something about the skewed nature of the first Tuesday text made it stand out just a bit too much from the others. That said, thank you for offering the first one to a lucky winner! It is most generous of you. I enjoy your blog, and your sharing of your faith. Your work is exquisite, as usual Jenny. Love both versions; however, I think I prefer the first version as the background of the window ledge really seems to make the flowers and the bird pop. I would love to have one of your creations sewn by you, if I am lucky enough to be selected. If not, congratulations to the winner. Thank you dear lady for all the lovely patterns that you share with all of us around the world, for your thoughtful words of wisdom, the pictures of your little corner of the world and for peeks at your wonderful family. Take care and God bless and thanks again for your generosity. Your blocks always look so lovely in the pictures. I would love to win this one just to see it close up and if I win I plan to use it in an organizer for my tablet. Thanks for thinking of all of us and being so generous. I am not sure which design I like best, but like the window in the first one. Thanks for the drawing! Both stitching are beautiful but like you said the second one has a softer look and feel! Love to own a piece of your pretty stitchery, thank you for the chance! Jenny I like the second one the best, but their both very pretty. I only would like to say I think the wing is a little bit to big for the bird that's just my thought. I am one of those people who cannot see things except how they are in the magazine or book. Yet my hubby can see it in so many other combinations. LOL So he buys a lot of my fabric, and says, Honey this will be your A, B, C, and so forth. He has yet to steer me wrong, and funny how this has brought us closer together due to a hobby. I was born on a Tuesday...many, many, many years ago. So that makes me a Tuesday's Child. I have an idea on how to use this block in a special project. I love both designs and I understand your reasons for changing it as the second design seems to "fit" better with the rest of the days of the week, but I'm kind of partial to the first one. Thanks for a chance to win. I love both of them but can see why you wanted it to be more rounded. I would love to get the chance to see your stitching in person. Thanks for the giveaway! I am not surprised at your generous nature. 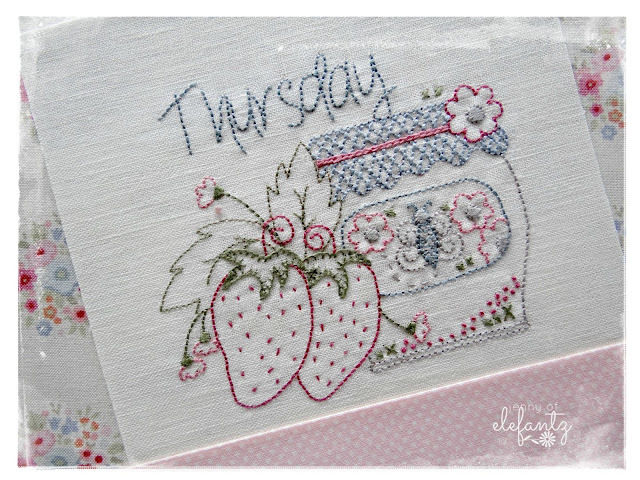 When I first started reading this blog entry, I thought to myself that there was nothing at all wrong with the first Tuesday stitchery! But after you redesigned it, I can see what was bothering you. The first one was more squared off, and the rest of the designs are more rounded. Both Tuesday designs are lovely, but the new one fits in with the others better. I would love to have anything you have stitched! You are a wonder, Jenny!! Your first design was beautiful but the second fits the other days perfectly, just as you said!! Your artistry and creativity never cease to amaze me!! I love your blog and the wonderful emails you send each week!! INSPIRATIONAL!!!!! Love Thursday - such a scrummy strawberry! What a lovely idea to have a giveaway with your orphan stitchery. Whoever wins will great love it. Jenny how sweet it would be too have something stitched by you.Both versions look very good to me.Thank-you for a chance to become a owner of one. Your designs are always beautiful. Having to choose between them . . . I think your decision for the second one was right. It is softer and more in line with the others. But honestly, I don't think anyone would have complained either way. Wishing you all the best.